We were awakened by the soft, polite voice of Dixon, our waiter. Yes, we had a waiter, and it was surreal. Every morning he would visit all the clients to make sure they were awake and offer them a choice of coffee or tea. Meals were held in the mess tent, a large domed tent with a table and ten chairs. Yes, we had a table and chairs, it too was surreal. The tent was stocked with an ample supply of tea, coffee, hot chocolate, Ovaltine, and more. Every condiment you could ever desire could be found. Breakfast included fried eggs, hot dogs, toast, chickpeas, pineapple, and runny oatmeal. Gross you ask? Actually, not. The oatmeal was made with ginger to help stave off any altitude-related nausea and it was purposefully runny to help us hydrate. Yes it was a bit strange the first taste, but by the morning of day two, I found myself looking forward to it. Our first breakfast didn't disappoint. Dixon serves up some soupy oatmeal. Yummy! After breakfast we had an opportunity to meet the full team supporting us. 45 people for 10 climbers. (5 guides and 40 porters some with additional duties like maintaining the toilet tents, managing our camp, cooking, and a waiter). Yes, we had toilet tents. Definitely some glamping going on here. Once the team of clients was mustered with our day packs ready to go, we departed while the porters stayed behind to break down the tents. Our guides kept us moving at a slow pace to avoid any ill effects from the altitude. The porters however, hike faster than climbers in order to get to the next camp and set everything up prior to our arrival. Since they carry up to 33lbs of our gear in addition to their own, they get the right of way on the trail. Marc, Ryan, and John step aside to let a porter pass on the narrow trail. As we climbed higher the vegetation began to change. We were entering the moorland ecological zone. We weren't quite above the tree line, so it was still easy to focus on the little details. The vegetation was definitely getting shorter and scrubbier. Once in the moorland zone, the trail began to get steep. Our guides stressed going slowly, or "pole pole" as they say in Swahili. Climbing higher and higher in the moorland zone, we are finally starting to see peaks and valleys one would expect to find on an expedition to climb a mountain. Here's one of our guides, Michael, who will be celebrating his 50th summit with us. 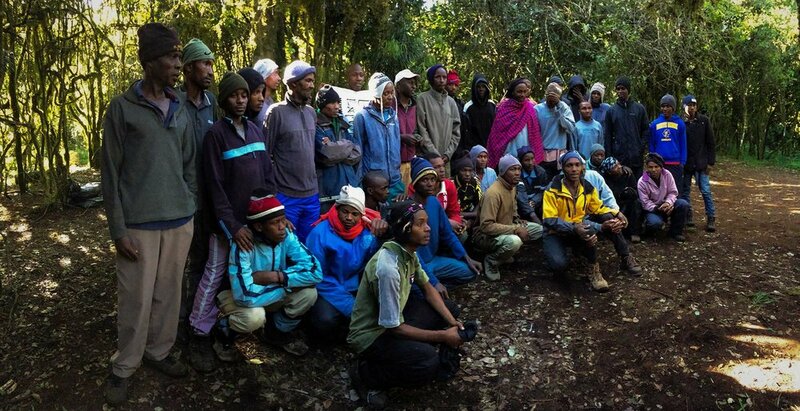 One of our guides, Michael would be celebrating his 50th summit of Kilimanjaro with us. The group stoped on a ridge for lunch above the trees before descending into Shira Plateau. You can see the afternoon clouds rolling in. The clouds arrive like clockwork each day. Only the early bird is blessed with a great view of the mountain. The clients were still getting to know one another and it was clear we were all on our best behavior. The guides circulated through the group as we ate making small talk. They were learning how we behaved and responded to stress and physical exertion at low altitude so that when we climbed higher they would be able to monitor our condition. Emmanuel, our head guide demonstrating the "hakuna matada" hand signal as he picks up the rear of our group—making sure nobody is moving too pole pole. In the afternoon we crested the final ridge and descended onto the Shira Plateau. Formed by a massive lava flow from Kibo, the largest of the Kilimanjaro's volcanic peaks. This eruption filled in the older Shira caldera leaving a virtually flat landscape ringed by the ridges of more ancient eruptions. From Shira Plateau, we could look back at the ridge we crested. Porters from the various tour groups were still streaming into camp hauling their sizable loads... on their heads. I can't stress enough how hard their job is and how much their efforts eased our trek. One of the reasons we chose Duma Explorer as our tour company is that they have a stellar reputation for treatment of their porters. 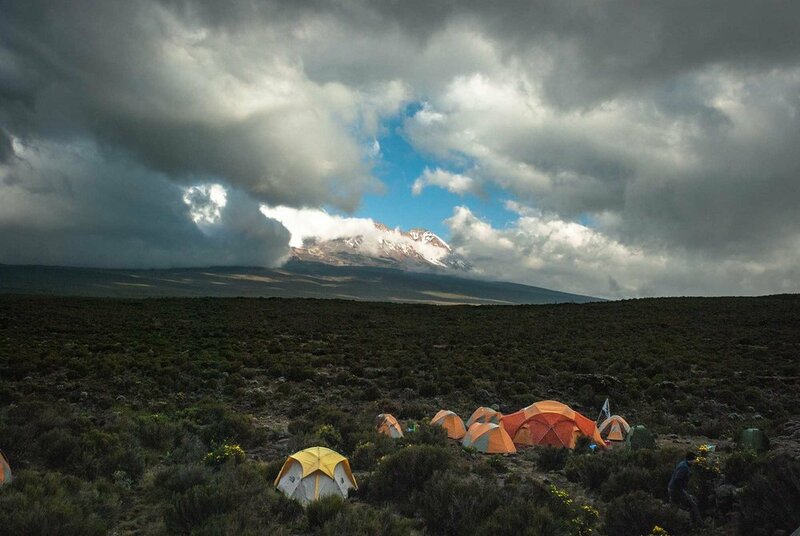 We pulled into Shira Camp 1 and were rewarded with a brief glimpse of Kibo, the highest peak of Kilimanjaro poking out through the clouds. It looked to us as if our mountain were miles away, but yet we are already at 11,000 feet. More than half way up the mountain. Words and photos really cannot even come close to describing the scale of this mountain. The clouds over Kibo blew out right before bed, so naturally it was time to find a big rock to stand in as a tripod for a long exposure. Special thanks to Philippe and Achraf for agreeing to keep their headlights steady in their tent. Welcome to the second day of our eight-day Kilimanjaro climb. If you’re just tuning in, you may want to start at the beginning of the adventure.